Homepage. This page: A lineup of British classics from the late 1950s and early 1960s. 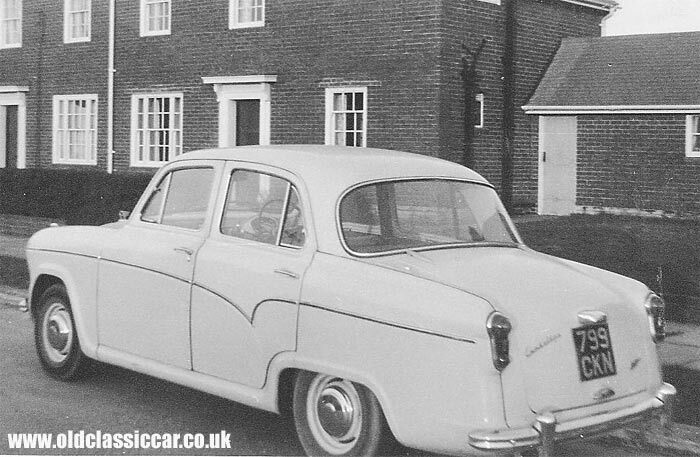 The first car shown, registration 746 AKT, is a 1957-on Austin A55 Cambridge saloon parked at the roadside and on wedding car duty by the looks of it. Behind it is a light-coloured BMC Minivan, complete with pressed metal front panel and roof vent, the latter confirmation that this is a nice early example. Just visible in the background is a Morris Minor saloon, completing this three car BMC line-up. Either this A55 has a heavy bride in the back already, or else the springs have decided to take on quite a sag all on their own. The Mini van by contrast looks to be sitting quite high from the road. The A55 Cambridge, with the long boot, was an evolution of a bodyshape first seen with the A40 of 1954. The earlier car was powered by a B series engine of 1.2 litres, which took over from the dumpy Somerset range and used a revised version of that car's engine. The A50 Cambridge was produced alongside the A40 saloon but had an enlarged 1500cc engine and benefited from some extra brightwork, so set it apart from its slower brother. In 1957 the car shown here, the A55 Cambridge, was launched, again with 1500cc but with a revised bodyshell offering extra bootspace, a larger rear window, and different chrome ornamentation. Manumatic transmission was also available. This car lasted just two years, when it was replaced by the sharp-suited Farina range. Commercial versions of the Mk1 (pre-Farina) A55 were available at this time, a van and a pickup, and continued in production into the early 1970s, long after the saloon had been replaced. Power output for the Mk1 A55 was 51bhp at 4,250rpm, with 81lb ft of torque being developed at a low 2,000rpm, so there was no benefit in thrashing this engine. The car could reach 75mph, with the 0-60 'sprint' taking over 31 seconds. Another A55 Cambridge parked at the roadside. Les dropped me a line with this picture from his family album. Shown below is his father's A55 Cambridge, registration 799 CKN. Les adds: "Cambridge 799 CKN, this followed the Hillman Husky and I remember the smooth bouncy ride it gave, it used to send us to sleep as kids on the regular journeys back from visits to the family in London". Thanks Les! Return to Old Vehicle Photos Page 6. 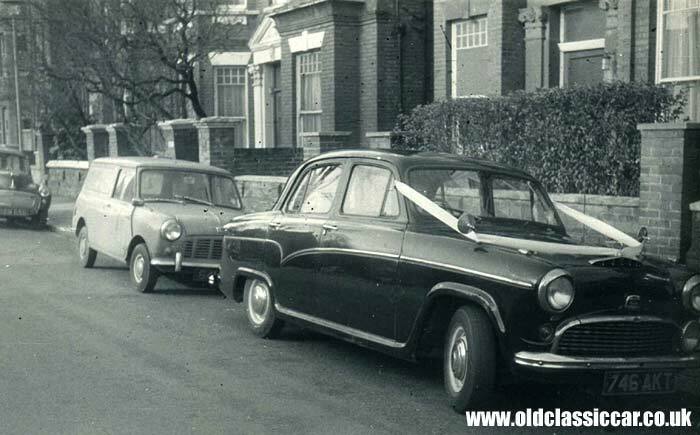 Lots of old Austins now feature in this vintage photograph section, with a different selection of A55 Cambridges to see on this page.